The ViewConn® Plus dual microscope design can significantly reduce inspection time. Patchcords drop into the top mounted scope, and with the flip of a switch, you can inspect in-adapter connectors with the hand held probe. In seconds, both male and female connector pairs can be inspected without changing tips. 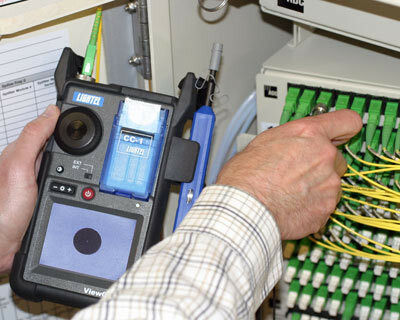 Like all ViewConns, the VC-6200-PL has a built-in patchcord cleaner allowing you to inspect, clean and re-inspect the connector while helping keep your hands free. A USB output is included for image capture and storage on your PC. One of ViewConn's optional power meters can be integrated with ViewConn Plus whenever needed.